A “Class of 1972” inductee, "Fernie" Flaman served as a player/coach with the Reds from 1961 to 1964. Behind the bench from 1961-1965, he compiled a 126-146-14 (.65) record during those four seasons piloting the Reds. As a player, he scored 63 points, 55 assists and 181 PIM in 155 games on the blueline. 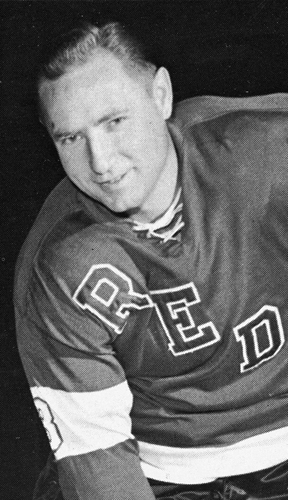 Like many other NHLers of his time, Fernie’s development was rushed because of the player shortage caused by World War II. A naturalized U.S. citizen, he was only the third American player to skate for the Toronto Maple Leaf’s when he joined them in 1950. Fernie amassed 1,370 PIM and 208 points during 17 NHL seasons between 1944 and 1961. One of the game’s great leaders and bodycheckers, the affable Flaman won a Stanley Cup with the Leafs in 1951 and played 12 seasons with the Bruins, serving as the team’s fearless captain from 1955 until the end of his NHL career in 1961. USA Hockey Coach of the Year in 1982, one of 17 years behind the bench at Northeastern University. He was later inducted into the Massachusetts Hockey Hall of Fame in 2011.